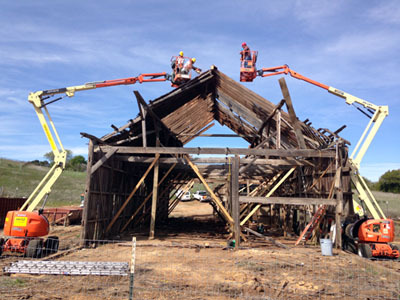 Crews began dismantling the historic Cowell Ranch hay barn on the UC Santa Cruz campus Tuesday (March 18), the first step in a multi-year process to rebuild it as a home for many of UCSC's leading environmental and sustainability programs. Workers will take apart the nearly 150-year-old barn. "We have to dismantle it piece-by-piece, we can't demolish it," said campus architect John Barnes. The process will be carefully recorded and materials that can be salvaged and reused will. Historic and timber-framing consultants are monitoring the project. The barn is constructed of massive timbers connected by mortise and tenon joinery, a carpentry art common in New England in the 1800s but rare at the time in California. A new barn will rise on the same spot replicating the construction methods but with modern materials including a concrete slab. "This is the most exciting project that's happened here in a long time, because the craftsmanship is so tangible and so beautiful," Barnes said. The 4,800-square-foot hay barn first rose on the Henry Cowell Ranch in the late 1860s. It is within the 32-acre Cowell Lime Works Historic District listed on the National Register of Historic Places. Workers this week added interior supports to prevent the structure from collapsing as it's being taken apart. Much of the existing wood has suffered termite and rot damage. Local contractor Mark Plainfield Construction is doing the deconstruction, a process expected to last less than a month. The project to reconstruct the barn will go to bid in late spring, Barnes said. UCSC students are scheduled to begin a quarter-long archeological excavation in the Cowell Lime Works Historic District area April 5 including at the barn site if it has been removed in time. The barn re-use plan is part of a multi-year project made possible by a $5-million gift from the Helen and Will Webster Foundation. The project is a key component in the coastal sustainability initiative of the $300-million Campaign for UC Santa Cruz. When complete it will become a focal point for environmental programs adjacent to the UCSC Farm on the southern portion of the campus. UCSC's many outstanding environmental programs include the Center for Agroecology and Sustainable Food Systems, Life Lab for grade-school children, Sustainable Living Center, Program in Community and Agriculture, Environmental Studies department, and Arboretum, each centered in different places on campus.